Are you looking for a fun family getaway or in search of the perfect romantic trip for two, or if you simply want to get away from it all, you can never go wrong with a cruise? Allowing just the perfect balance between the great outdoors, sophisticated hotel accommodations, and travel, a cruise trip combines everything we often look for in the ideal vacation. Now, the question – where and how can you find the best cruise to maximize your money’s worth? 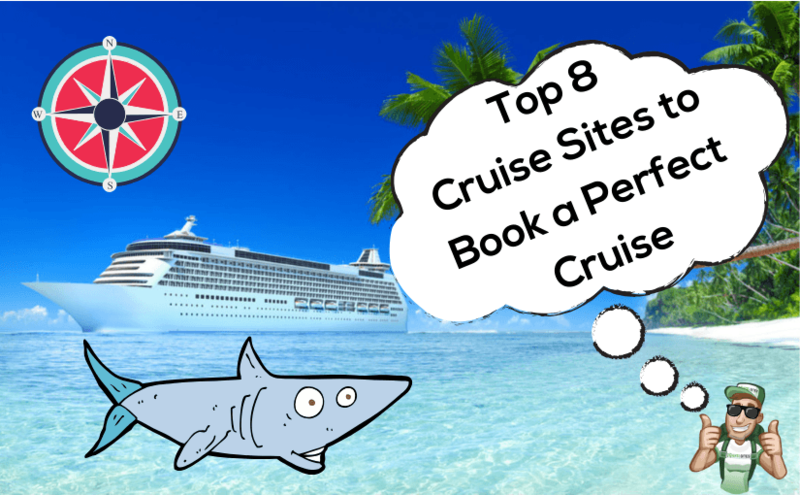 Before you throw cash on the first cruise trip offer you stumble upon, do yourself a favor and get that due diligence done by checking out these top 8 websites to find the best cruise trip deals. 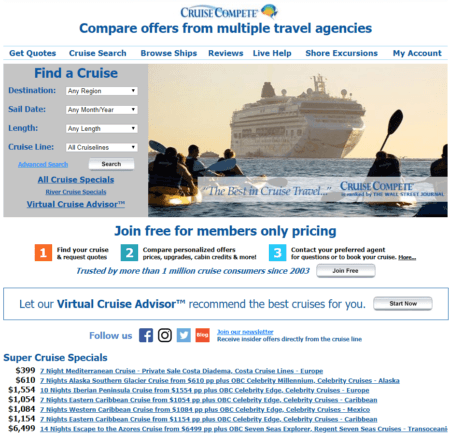 Think of Cruise.com as the go-to authority for anything and everything cruise-related. 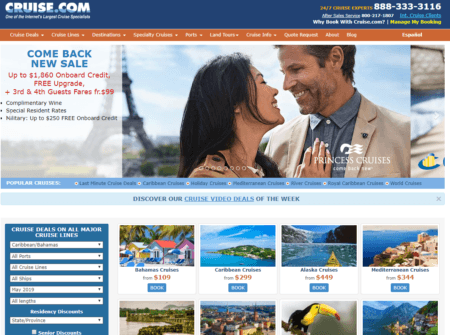 Having been around for decades, Cruise.com offers a complete directory of cruise ship deals from the Caribbean to the Mediterranean. This Florida-based travel agency is a proud member of the Cruise Lines International Association, giving them impressive access to a wide selection of deals and discounts you might not be able to find anywhere else. 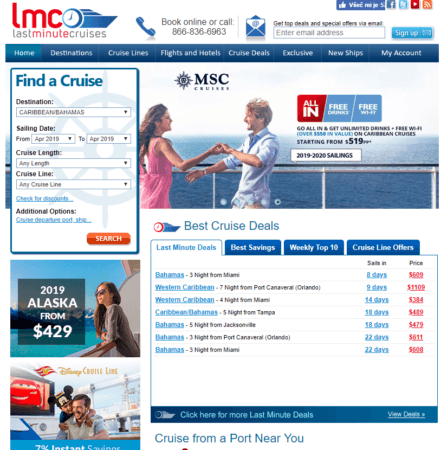 On their website, deals are impeccably categorized into destinations, deals, liners, and specialty liners, making the entire browsing experience seamless and straightforward. This makes it incredibly easy to find the perfect cruise for you – whether you’re hoping to cater to family, friends, or to just your special someone. Forgot to book that special vacation you promised your wife for your anniversary? Don’t sweat it – Last Minute Cruises probably has a deal for you minus the hefty price tag. Offering deals for trips on premium cruise liners that sail in a matter of days or weeks, Last Minute Cruises is your reliable source for booking last-minute reasonably priced cruise offers. With a pristine website that makes it hassle-free to browse through your options, you’ll be sure to find the ideal cruise trip to make the most of that upcoming vacation opportunity. The best part? This travel agency guarantees the best rates for last-minute reservations, saving you a few extra green to spend when you make it to your luxury destination. If you’re after impeccable service, pristine liners, and a really fun time, Carnival might be able to satisfy your standards. This cruise liner is one of the most popular across the country, and caters to some hundreds of thousands of clients every year. Enjoy on-board musical performances, stage shows, electrifying night time parties, casinos, and waterslides. Really – it’s a complete carnival of fun things to do for the whole family. Carnival takes pride in its 26 premium luxury cruise ships which travel to any and every cruise destination you might want to try. And hey, if you’re a Carnival Mastercard holder, the deals can get pretty sweet with incredible rebates, discounts, and a whole lot more. If you’re a real stickler for bargains and you don’t want to bite into a deal that doesn’t offer the best rates, then perhaps you might benefit from a visit to CruiseCompete. Their name doesn’t lie – on their site, you’ll find a collection of offers from every agency you can think of so you can get all the rates served all together so you can compare and find the right one for your budget and preferences. Operating since 2003, CruiseCompete offers some of the friendliest customer support services you’ll find online. So, you can be certain that every time you reach out to them, you’ll get the perfect deal with little fuss. Second only to Carnival, Royal Caribbean Cruises is one of the largest cruise line operators the world over. Of course, while they also offer world class amenities and luxury accommodations, you’ll be surprised to learn that they offer cruise deals for less than $300 USD, making them one of the most affordable liners around. On-board the Royal Caribbean Cruise ships, you’ll find exciting experiences to try for the whole family as the liner goes the extra mile to make sure their ships are accessible to even the differently abled. Not everyone has the financial freedom to book an expensive luxury cruise, but because most of us still want to be able to experience that lavish lifestyle, Costco Travel Cruises makes it possible. 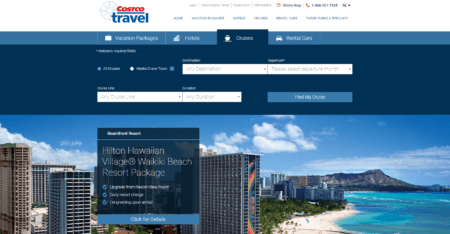 A branch out of Costco Wholesale, Costco Travel Cruises is the number one source of affordable deals that span destinations from Japan to the Glapagos, and everything in between. Their website gives you all the basics, and makes the ideal venue for first time cruisers to find out what would work best to introduce them to the wonderful world of cruising. Vacations to Go provides cruisers an extensive selection of cruise deals – from discounted specialty offers, to last minute bookings, to affordable extended stays and more. Their user-friendly and intuitive on-site tools make searching for the perfect cruise easy, breezy. Another way they stay ahead is by making sure you don’t have to pay any extra booking fees. Giving you impressive service without compounding the price you have to pay, it’s easy to see why you might want to visit their site before you seal any deals. 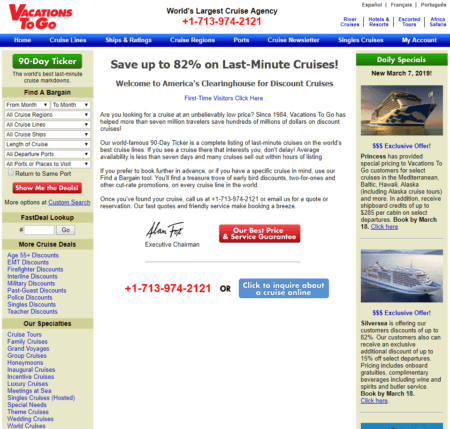 Last on our list is iCruise.com. 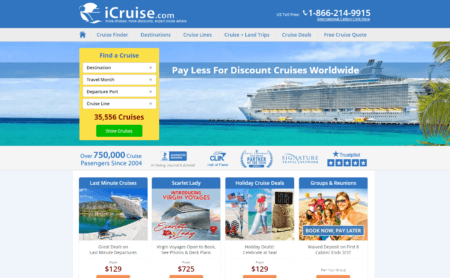 Offering an extensive array of discounted cruise deals, iCruise.com is a popular choice among singles and couples looking for budget-friendly packages that still offer world-class accommodations and activities. 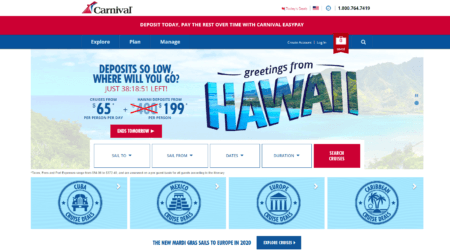 The iCruise.com platform focuses on making payments and fees easy on the pocket, even offering deferred deposits on some of their deals. A cruise can be a vacationer’s dream-come-true… but only if you’re careful enough to make sure you’ve chosen the right deal for yourself and your family. Don’t jump to bookings and end up wasting money on a cruise disaster – check out these websites to make sure you’re getting the best value for your money for that experience of a lifetime.